Today, more energy is contracted through corporate renewable energy power purchase agreements (PPAs) than the country of France consumes annually. The rapid growth of corporate renewable energy procurements has been driven by an aspiration to reach 100% renewable energy on a net basis. Some forward-leaning companies have already reached this goal and their achievements should be celebrated. However, that raises the question: is that milestone the pinnacle of success, or is there a next step that corporations can take in regards to renewables? In our view, the next frontier is ensuring that renewable energy is actually powering corporate facilities when they have load—100% renewable energy 100% of the time it’s needed. What do we mean when we say 100% renewable energy on a net basis? 100% renewable energy on a net basis means that in a year, the amount of renewable energy sourced by a company is equal to the amount of electricity that the company consumed. This is analogous to net metering for residential solar. Sometimes I’m buying from my utility, sometimes I’m selling back to my utility, but at the end of a billing month, my imports minus my selling equals zero. As we have explained in other posts on the Fluence blog, as renewable energy penetration increases, the value of additional renewable energy on the grid decreases due to falling capacity value. California is a prime example of this, where solar over-generation is causing the duck curve to grow larger and faster than anyone expected. Each additional megawatt (MW) of solar added to California’s grid is less valuable than the last and the state is already experiencing days with significant solar curtailment. Adding additional solar energy to a grid that is already curtailing solar generation will not achieve the additionality that corporate renewable energy procurements seek, as that new solar is not offsetting the energy generated by fossil fuel generation. It is simply being thrown away, as the grid is already swimming in solar energy during peak solar generation hours. This means that achieving 100% renewable energy for corporations will get harder and harder, particularly in areas that already have a high penetration of solar generation. It’s like a mountain whose terrain gets steeper and more difficult to climb each time the previous climber gets to the top. Procuring only renewable energy on a net basis is not a scalable solution to create a sustainable renewable energy market where everyone can achieve 100% renewable energy. Corporate renewable buyers should also consider how their procurement decision impacts the rest of the electric grid. If corporate off-takers are able to match their renewable energy generation profile—whether through power purchase agreements (PPAs) or self-generation—to their consumption profile, they will know that they are not making the duck curve problem worse. Most companies already consider some aspects of additionality when procuring renewable energy to ensure that their investment is actually reducing carbon emissions, not just reducing them on paper. For example, many companies prefer renewable PPAs over green tariffs as they drive construction of new renewable projects, whereas green tariffs reallocate existing renewable generation but don’t necessarily cause new renewable projects to be built. 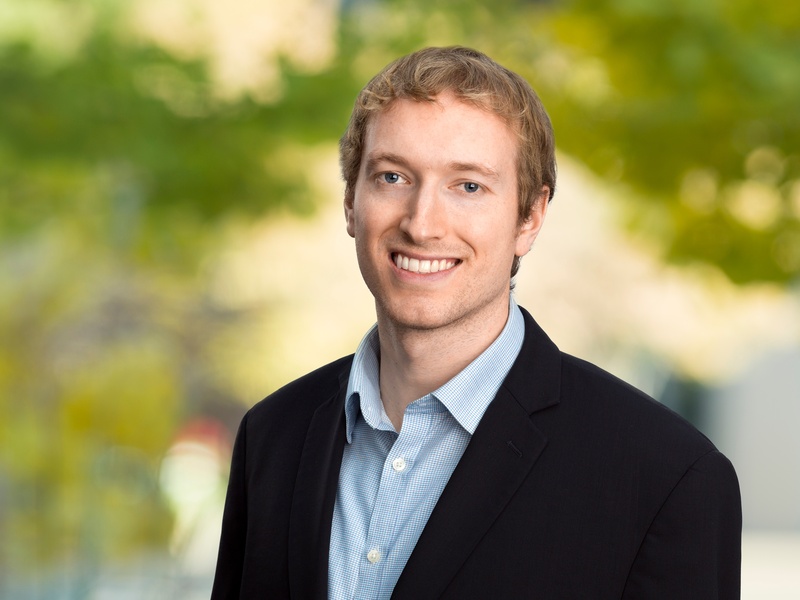 Considering the time attributes of renewable energy is the logical next step for corporate renewable energy leaders to ensure that the entire grid can decarbonize. Consider the graph below for a hypothetical facility with a 24/7 flat load. Because the load of the facility does not perfectly correlate to the solar generation profile, meeting the target of 100% renewable energy on a net energy basis means that only 40% of the facility’s electricity needs are met when renewable energy is produced. 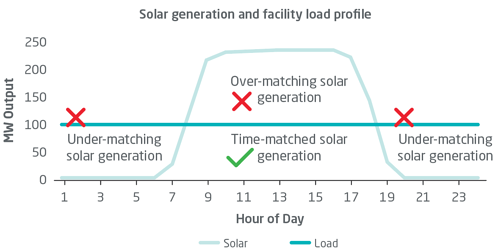 This occurs because the facility is over-matching solar generation from 9 am to 6 pm, but under-matching solar generation from the grid from 7 pm to 8 am. If the local grid generates electricity from coal during the night, this means that the facility is actually consuming coal energy 12 hours per day (see below). It is a similar story for wind. Utilizing a portfolio of both wind and solar more closely matches consumption because wind typically is strongest during the night, and solar during the day; however, this will still only result in 50-70% time-matched renewable energy (see table below). Achieving 100% renewable energy on a net basis is a great start – the stretch goal is achieving 100% renewable energy 100% of the time, or 100x100. This could be accomplished using Time-matched Renewable Energy Credits, or T-RECs. Reaching 100x100 will certainly be a difficult task, but reaching 100% renewable energy on a net basis also seemed daunting 10 years ago. Based on the economics of energy storage and renewables, our modelling shows that 80-90% time-matched renewable energy consumption is realistic today for a facility with a 24/7 flat load using a combination of wind, solar and storage. Additionally, it would provide a stepping stone to achieving 100x100. Some corporate leaders have already achieved the summit of 100% renewable energy consumption on a net basis. We applaud these leaders for driving the industry forward. The next challenge for these leaders in driving the world towards a more sustainable future is to create a framework, like T-RECs, that values capacity so that renewable energy is scalable to all commercial and industrial companies as well as the grid at-large. Some large players like Google have already begun to think about these issues with their white paper on 100% carbon-free electricity. 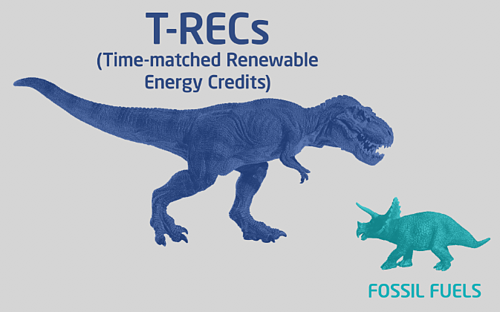 The next summit to reach is achieving 100% renewable energy 100% of the time so that our grid is less reliant on fossil fuels left over from the days of the dinosaurs. This will also pave the way for more companies to reach the first summit of 100% renewable energy. Corporate leaders have already changed how electricity is procured. Continued innovation in corporate sourcing of renewable energy has the potential to drive further electricity decarbonization and put the world on a path to keep the rise in global average temperatures to below 1.5°C.